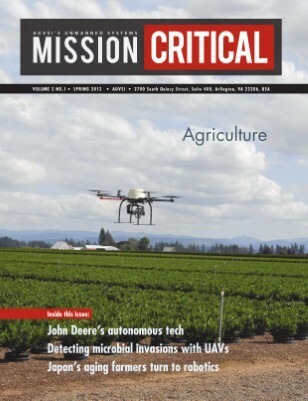 AUVSI is proud to present the fifth edition of a new electronic quarterly publication, "Mission Critical." Each issue will examine a different topic area in depth. This issue examines the use of unmanned systems and robotics in agriculture. We report on a strawberry-picking robot in Japan, trace the increasingly high-tech history of John Deere and catch up on studies of airborne pathogens using unmanned aircraft. We also interview leading technologists and end users, look at some of the challenges facing the industry and report on some of the latest developments in agricultural technology. Take a look, let us know what you think, and stay tuned for the next issue, which will focus on the world of commercial robotics.